"Singaraja is a blatantly Indonesian city, the former capital of Bali on an island full of tourists, while towns around it are full of foreigners. Somehow Singaraja has escaped this type of tourism. 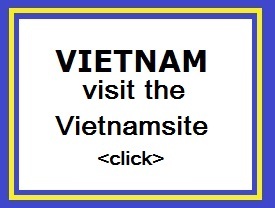 It�s largely unventured by foreigners. Nobody goes backpacking in Singaraja. In fact, no travellers really ever go to Singaraja. It�s a shame cos this is a great wee city." Singaraja is an old port city in the middle of the north coast of Bali. It is the second largest city in Bali (approximately 120,000 inhabitants). 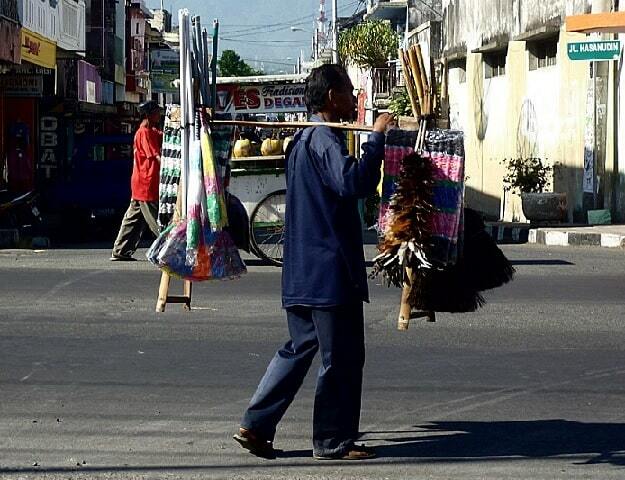 It is the former colonial capital of Bali, and now the capital of Buleleng regency. Buleleng was also an old Balinese kingdom. The port of Singaraja also called Buleleng. The Dutch colonial past of Singaraja is still visible through the architecture of the buildings, especially those located in the old port area. Whitewashed warehouses still breathe the atmosphere of the old days, when the port was flourishing with the trade of spices, like vanilla and tobacco. Since the colonial time Singaraja been an important educational and cultural center. Today, the city has two universities. Singaraja is for many an attractive city, thanks to a persistent colonial 'atmosphere' and a number of well-preserved colonial buildings. Especially in the south of the city with small, winding streets that will make you wander here. In 1995 Singaraja won a national prize for the cleanest and best maintained city in Indonesia. The people in Singaraja are very friendly and helpful. The centre of town is at the junction of Jalan Gajah Mada and Jalan Jen. Ahmad Yani. Here you will find banks, a post office, small hotels, a number of small restaurants and local market Pasar Anyar that evening turns into a "night market" with food stalls. 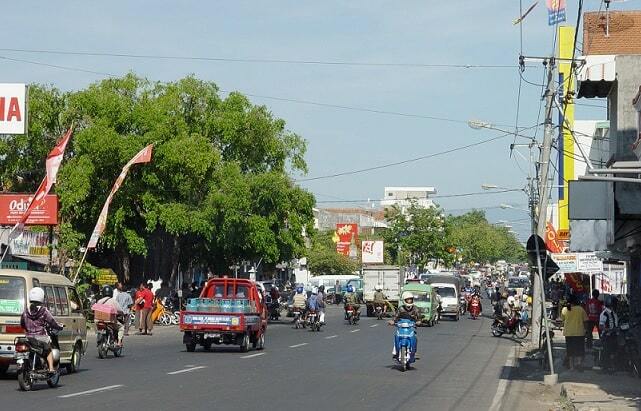 You'll find he port area of Singaraja immediately north of the city centre. There are still many old warehouses in the port dating from the Dutch colonial time. These warehouses are no longer in use. Before they made in Denpasar, Singaraja was the port where adventurous tourists came ashore by boat. Besides the Dutch heritage, there are also Chinese and Islamic influences to be found. The descendants of Chinese, Arab and Bugis settlers still live in the harbour district and you'll find neighbourhoods with names like Kampong Arab and Kampong Bugis. There is a beautiful Chinese temple (Klenteng), the "Ling Gwan Kion". It is located near the Jalan Erlangga, near the ocean in the port of Singaraja. 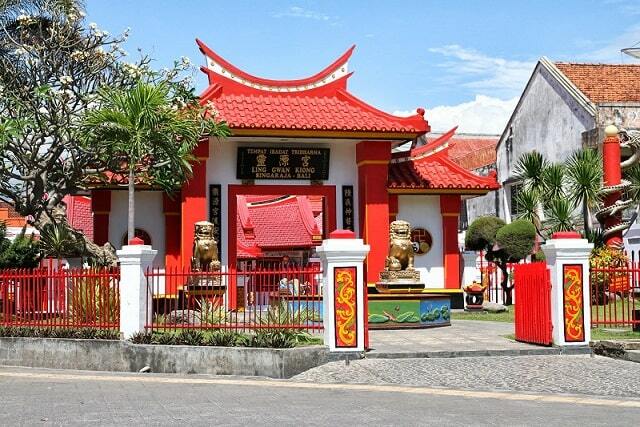 This temple is one of the few Chinese temples in Bali. It is accessible by a bridge over a lotus pond and the temple has beautiful golden Buddha statues. The temple was founded in the year 1873 and has been renovated several times. A unique "lontar" museum and library, the "Gedong Kirtya", can be found on Jalan Veteran near the centre of the city. The Gedong Kirtya collect, copy and save thousands lontar (manuscripts made of palm leaves), "prasati" (transcriptions on metal plates) and books dealing with various aspects of human life, including religion, architecture, philosophy, genealogy, homeopathy, "usada" (medical manuscripts), black magic, etc. Much has been written in the Balinese language and Kawi (old Javanese language). But there are also works in Dutch, English and German. The museum and library are open to visitors on weekdays but on weekends and during public holidays it is closed. The Royal Palace of Singaraja "the Puri Agung Buleleng" is near the lontar library "Gedong Kirtya", along Jalan Mayor Metra. Puri Agung, which has been renovated several times and is now sparsely opened to the public, for those who are interested in the history of Buleleng (North Bali). Visitors can take a number of pictures of the Rajas (Kings) of Buleleng seen in the old house, where the last Raja and his family lived. The descendants of Raja's still live here in the house, and there is a chance that you will meet HRH Crown Prince Ngurah Ugrasena, grandson of the last Raja of Buleleng, Anak Agung Panji Tisna. He ruled until 1950 and was also a well-known novelist and the 'founder' of the tourist resort of Lovina, when he decided to build the first stay accommodation in Lovina. There are lots of statues to be seen in Singaraja. When you want to see some of these statues you can better take a city tour with a traditional dokar (horse and carriage). That's the perfect way to see the most statues of Singaraja in an old fashioned way and soak the atmosphere of the old town. There is a dokar 'station' in the center of Singaraja near Pasar Anyar II Market, Jalan Gajah Mada. The market of Singaraja, "Pasar Anyar II", is on Jalan Gajah Mada in the center of the city. This market is worth a visit, especially during the cool morning hours, around dawn. The market consists of two floors. Every morning hundreds of Balinese visit this rural market to buy vegetables, fruit, fish, meat and flowers. There is also a section where you can buy clothes for little money. 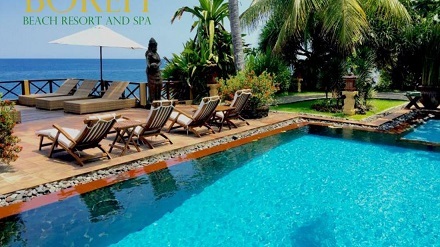 This tranquil property resides on the northeastern coast of Bali in the village of Sembiran, right between Singaraja and Amed. Surrounded by tropical gardens right on the sea, Villa Boreh Beach Resort & Spa is the perfect retreat and sanctuary for those who seek serenity. The property boasts a fine selection of cozy guest units along with a wide range of on-site activities, ranging from yoga and archery to diving and sport fishing. Adventurers can also arrange excursions and tours to explore the island. Enjoy a holistic treatment in the Boreh Spa treatment center which offers massages, facials, and body scrubs, utilizing their own line of Boreh Spa products, manufactured on-site and using 100% natural ingredients. When you are looking for comfortable and convenient accommodations in Bali, make Villa Boreh Beach Resort & Spa your home away from home.